Nighthaunt and Stormcast Endless Spell Preview! 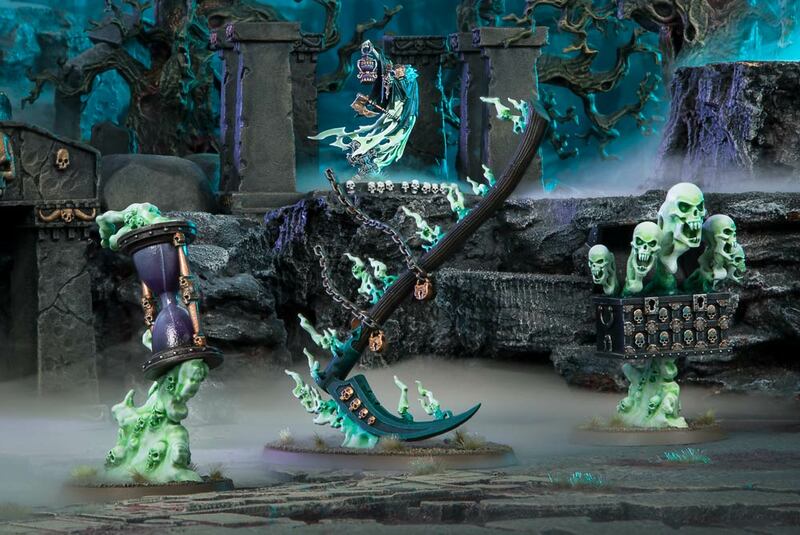 Warhammer Community have shared details about the new faction exclusive Endless Spells coming with the Nighthaunt and Stormcast Battletomes a week on Saturday! Really hope we see these for every faction! 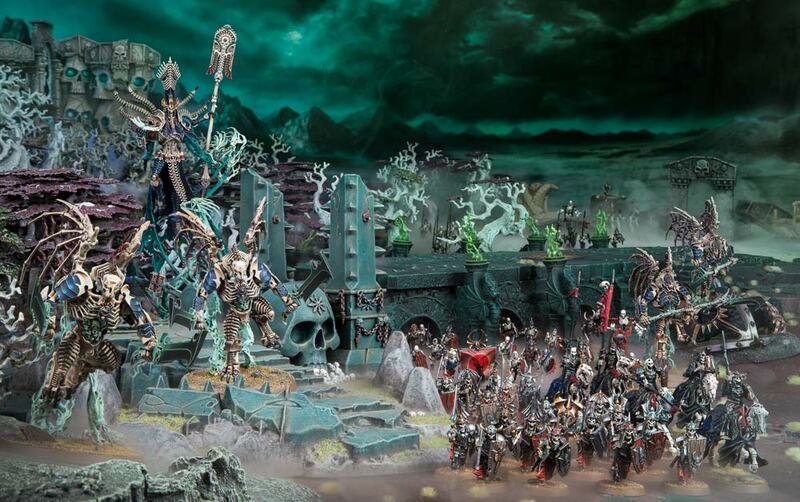 This weekend doesn’t just see the pre-order of two new battletomes and some incredible Nighthaunt and Stormcast Eternals models, but also the first two sets of faction-specific endless spells! Sometimes, however, you’ll want to play a little more defensively – and for that, the Dais Arcanum is ideal. This flying platform boosts the saves on any who ride it, allows them to fly and gives them an additional unbind in the hero phase – in short, it’s perfect for upgrading any of your pedestrian Wizards. One of the most fun, however, has to be the Everblaze Comet. 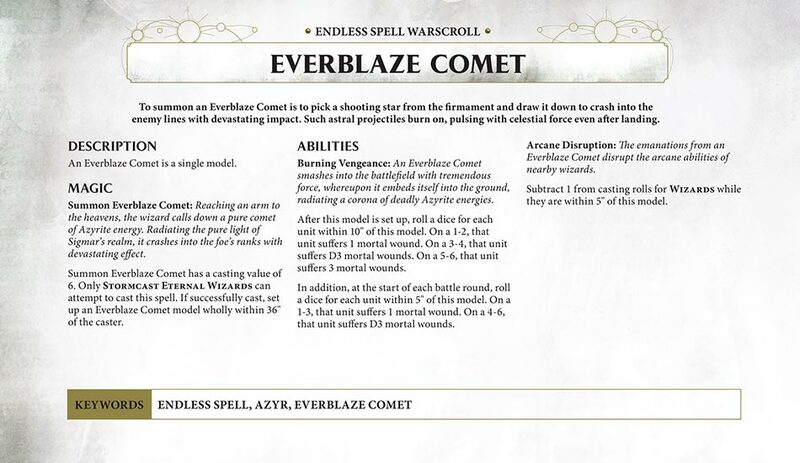 Dealing loads of mortal wounds to nearby units when it arrives (friend or foe), the Everblaze Comet is a great way to knock a chunk off your opponent’s army and boasts a massive range of 36″, allowing you to cast it from outside your opponent’s unbinding range. Where it really comes into its own is in subsequent turns, unleashing pulses of mortal wounds at the start of each battle round and dampening enemy casters. We’ve already taken a look at one of the otherworldly conjurations from Endless Spells: Nighthaunt – the Shyish Reaper – but what about the other two spells from the set? 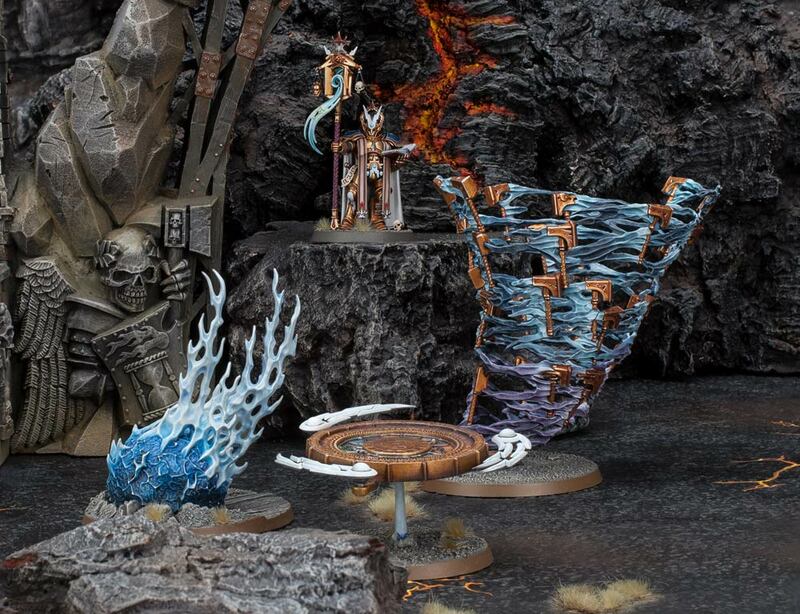 Both provide some additional offensive options for your Nighthaunt army, allowing you to output a steady trickle of mortal wounds to help grind your foes down. 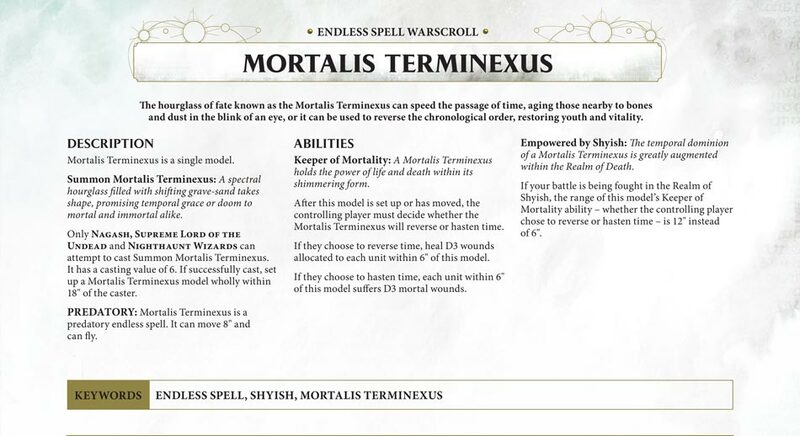 On the other hand, you have the Mortalis Terminexus – a double-edged endless spell that’s flexible, if a little risky to use. We’d recommend shooting for the second turn where possible when using this endless spell – with a durable army like the Nighthaunts, getting double-turned early on shouldn’t hurt your plans too much. You’ll be able to pre-order all of these spells this weekend, while if you’re looking for Wizards to cast them with, make sure to get your hands on a copy of Soul Wars – available to pre-order online and in stores this weekend.